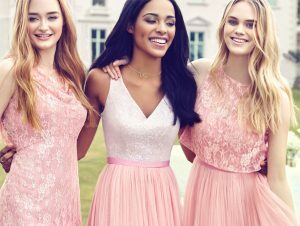 There’s a myriad of decisions to make when planning a wedding, and one of them is choosing the bridesmaid dresses. You will have to decide for the colour, the material, the length, the price point, and the style of the dresses. And while doing that, you have to keep in mind that they should look cohesive together. While you’re on track of planning for your bridesmaid dresses, it comes in handy to know what styles your girls may not like to wear. After all, they are your friend, and you want them to feel and look their best on this very special day. Fortunately, bridesmaid dresses today no longer have to be identical. If we think about it, women don’t find it fun to match their friend’s outfit—same goes with your bridesmaids. Leave the matchy-matchy trend to the flower girls, and let each of your bridesmaids shine in their own unique and gorgeous dresses. Even if it’s the most stunning collection of bridesmaid dresses, you will get a giant pout on your bridesmaids’ faces if they have to spend a third of this month’s paycheck for their dress, especially if it’s a dress they can’t wear again. As an alternative, look for couture dresses in a bridal boutique that your girls can rent for a day instead. You can spend a fortune on your own wedding dress if you want, but don’t impose the same on your bridesmaids. Other than possibly making your girls feel uncomfortable, there are several reasons why you should avoid hemlines that are too short. First of all, if it’s going to be a church wedding, dresses from a bridal studio in Singapore that are cut mid-thigh is not respectful on the wedding’s religious aspect. Secondly, dresses that are too short will likely draw unwanted attention, particularly here in Singapore. And lastly, when bridesmaid dresses are too short, it can take away the attention from the bride. The dress should have some shape to it. Everyone’s body is unique, so the best you can do is to let your bridesmaids choose the right dress for them. Most likely, they know what their body shape is and are aware of the dress styles that flatter them the most. You can also ask the consultant in the bridal boutique for dress suggestions for your maids. That off-shoulder dress or one-shoulder gown may look striking on one of your bridesmaids, but the others are probably silently dreading it right now. According to bridal studio consultants, it’s best to avoid hard-to-pull-off dress styles, such as fitted gowns and halter dresses. Other no-nos include puffy shoulders, tutu-like skirts, and lace ruffles to name a few. Try to avoid dress styles that are far outside your bridesmaids’ comfort zone to ensure they feel and look their best. By glitzy, we mean hideous looking prom dresses that are decked with sequins and patterns all over them. If you’re unsure of your chosen bridesmaid dress style, it could probably pass as Halloween costume. When choosing dresses, keep in mind that less is more. It’s always safer to go with simple and sleek styles than with elaborate and flashy ones. •	Be Upfront About Budgets. Don’t put off having this conversation among your girls. This will help determine where you should shop at. Luckily, bridesmaids today have a variety of great options at any price points. •	Do Advance Research. Know what dress style to look for before making appointments in any bridal studio in Singapore—it’ll make dress shopping much easier. Every dress style can be seen online, so researching is easy (and fun!) and will save you a lot of time later. •	Spare Plenty of Time. Unless you’re buying off-the-rack dresses, you need at least three months from when you place your order to when you’ll pick them up. Order for the entire party must also be made at once to ensure quality control. •	Have Your Ladies Professionally Measured. It’s important to provide your bridesmaids’ exact measurements in order to avoid last-minute problems. Although many boutiques in Singapore have their staff measure your bridesmaids, they are not seamstresses. Especially when ordering online, a measurement made by a professional is crucial to get the perfect dresses for your girls. •	Set Multiple Appointments at the Studio. Don’t bring all of your bridesmaids into the bridal studio the first time you shop for their dresses. Instead go with one or two of your maids and let them help you narrow down your choices. Once you have found a few styles, have the consultant set them aside. Then, bring the rest of the girls on your next appointment to decide. •	Inquire About Extra Length. If one of your bridesmaids stand 5’7” or above, she might need some extra length for her long dress, especially if she’ll be wearing heels. During the initial fitting, ask your maids to bring their heels with them to help with the dresses’ adjustments. But also keep in mind that there’s often an additional cost associated with these special adjustments. Just like looking for your wedding dress, shopping in a bridal boutique for your bridesmaid dresses needs time and patience. But if after all the effort there are still people you cannot please, don’t give in to pressure to make everyone happy. Keep in mind that it is your special day and it should be going to be about you. Your bridesmaids are there to support you and (ideally) work with you to make things a lot easier.